Seen here in the Dallas Opera production, “Everest” is set in the so-called “death zone” at the very top of the world’s highest mountain. 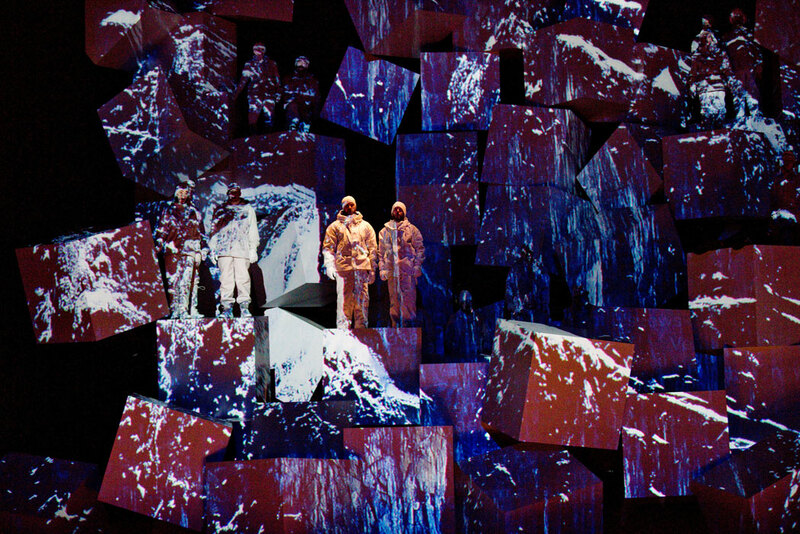 “Everest” was commissioned by the Dallas Opera, which presented the premiere production (pictured) in January 2015. Lyric Opera of Kansas City is mounting the second production. In the spring of 1996, “Outside” magazine sent writer Jon Krakauer to Mount Everest chasing a story: the commercialization of Everest. Since 1985, tourists with little or no climbing experience had been able to reach the summit thanks to company tours designed to allow any reasonably fit person to make the trek. In the years that followed, as many as 40 people per day reached the summit as a part of a paying group. Krakauer’s thesis as he set out to climb the mountain in 1996: Why are tourists with more money than expertise being taken up Everest in the first place? The 1996 Everest tragedy has been the subject of five other nonfiction books, one made-for-TV special, a documentary and a 2015 Hollywood movie. Now, it’s been recast as an opera. Those who’ve read Krakauer’s “Into Thin Air” will be familiar with the plot, which follows commercial mountain guide Rob Hall, an accomplished New Zealand mountaineer, and his client Doug Hansen, as they make their way to the summit and then attempt to descend through the blizzard. The two climbers die, but not before Hall manages to make a final call to his pregnant wife, Jan. Meanwhile, Beck Weathers, also a client of Hall’s, survives the ordeal despite being left for dead twice. 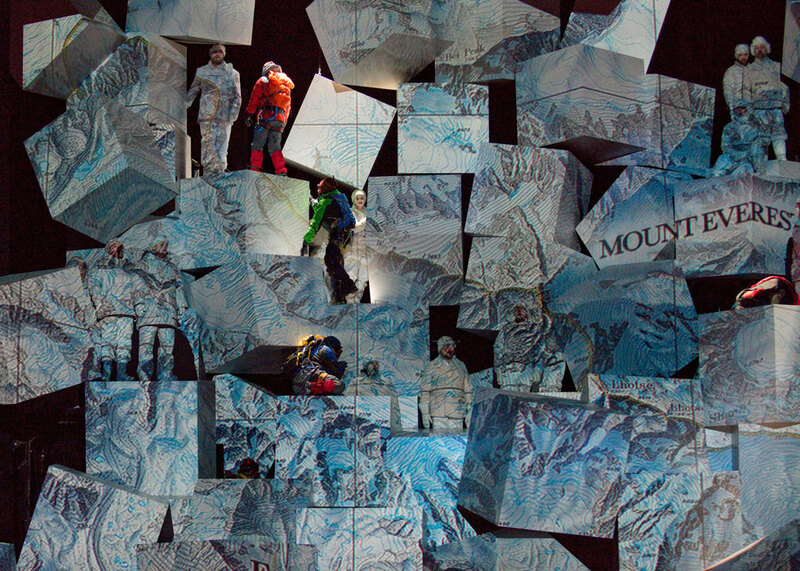 “Everest,” with music by Joby Talbot and libretto by Gene Scheer, was commissioned by the Dallas Opera and had its premiere there in January 2015. “Everest” comes to the Kaufmann center in November, as a part of the Lyric Opera of Kansas City’s 2017-2018 season. English composer Joby Talbot was tasked with bringing the aural world of Mount Everest to life. Talbot’s compositional history is diverse — among more conventional output, he’s written theme and score for the BBC comedy series “The League of Gentlemen,” the film score for the recent animated film “Sing” and two ballets for the Royal Ballet. The story is not the mountain. The story is how humanity and the mountain come to terms with one another. “Everest” is his first opera. “I found the experience of writing an opera immensely fulfilling,” Talbot says. The orchestral forces required for Talbot’s score are substantial, with triple winds, two pianos, a large string section and so much percussion that it almost cannot fit into a pit. These effects are achieved through the varied percussion, use of harmonics and glissando in the strings, and long unison pedal tones that slowly grow from consonance into dissonance. The musical tableau Talbot created for the mountain could almost be a stand-alone tone poem. But the story is not the mountain. The story is how humanity and the mountain come to terms with one another. As Scheer was writing the libretto for “Everest,” he researched George Mallory, the English climber who disappeared during the 1924 British Mount Everest expedition. He also reviewed the long history of people who’ve died on Everest, and interviewed survivors of the 1996 tragedy. They included Beck Weathers, who told him first-hand the story of being left for dead in the blizzard and walking to camp on his own. Programming a new opera is a leap of faith. A premiere always garners attention but, in many cases, after the premiere, operas are lost to history. It’s the subsequent performances of an opera that tend to determine whether it enters the repertoire of major companies or not. The Lyric Opera of Kansas City has been involved in at least two second productions that helped propel the operas into the mainstream: Samuel Barber’s “Vanessa” premiered at the Metropolitan Opera in New York in 1958. Kansas City gave the second performance of the piece five years later in 1963. Carlisle Floyd’s “Of Mice and Men” was first performed at the Seattle Opera in January 1970 by the Seattle Opera. A few months later, the opera graced the stage in Kansas City. Both operas are now part of the established operatic repertoire. Krista Lang Blackwood is an award-winning educator, performer and freelance writer. When she's not teaching or performing, she combs the greater Kansas City region for off-the-beaten-path arts and culture offerings, usually in the company of her husband and precocious, French-speaking son.